The United Kingdom is at a pivotal moment politically. The next ten days will have ramifications for decades and could change British politics beyond recognition. The current direction of travel is to leaving the EU on the 12th April without a deal, negating the requirement to pay £39bn, an option seen by many as the Brexit voted for back in June 2016. A 75% “Remain” Parliament is becoming increasingly desperate, offering vote after vote for ‘softer Brexit” options, a second referendum and extending article 50. All have failed to gain majority support. Most “Remainers” seemingly don’t want to remain any more. 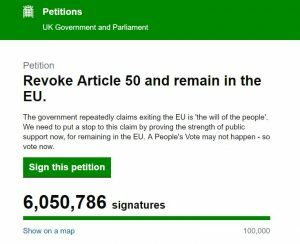 Only just over a third could be bothered to click sign a petition (6m at time of writing) to demand article 50 is revoked. This means that two thirds do not feel strongly enough to sign it. This is a clear message that the country is weart and demanding Brexit is delivered, a message the politicians and media are bizarrely choosing to ignore. The political class and mainstream media have deliberately manufactured a narrative that has turned a straightforward binary vote into something of incredible complexity. We now have a situation where politicians, servants to the people, are acting against the democratic wish of the democratic majority. To hear the politicians today, one would think the entire Brexit argument was based on trade and economics. It wasn’t. Every poll shows this wasn’t the priority for Leave voters. They were happy to take the economic risk for the bigger prize of freedom. The LordAshcroft polls surveyed a number of British voters and part of the results showed these main reasons. 49% “the principle that decisions about the UK should be taken in the UK”. The media has refused to hold politicians to account for this narrative shift as too many have vested interests, ie EU funding. Personal gain is placed above protecting democracy and as such we now have the situation where ‘the people’ have been pitted against ‘the establishment’. Theresa May repeatedly stated a ‘bad deal is worse than no deal’, but once her ‘deal’ was rejected as a bad deal, it has been uttered no more. Why aren’t the media and opposition holding her feet to the fire on this? As such, Brexit voters can be smeared as racists, thick, xenophobes and a whole world of inflammatory insults with little rebuke. David Lammy compared a pro Brexit rally to a Hitler rally, applauded by Anna Soubry who recently felt she couldn’t go home after being called a nazi by James Goddard, such was the offence of the term. PUBLIC ORDER ACT: ANNA SOUBRY V YELLOW VESTS Their hypocrisy is staggering, but worse than this, it is stirring anger across the general public outside on the London bubble. In France, we see what happens when the Government refuses to listen to the people and it is a frightening situation FROM RUBBER BULLETS TO FLASH BALLS – how far way are we from that in the UK? Pro Brexit voices that the working class can relate to are being literally silenced – Tommy Robinson, speaker at the pro Brexit rally has had his YouTube restricted. His Facebook and Twitter already long gone. Big government is crushing dissenting voices, but history shows that never works – it enflames the situation. The Government can honour the referendum and their commitments and promises by leaving with no deal on the 12th of April. This would deliver the referendum as specified in 2016. The £39bn can be invested in the NHS and other projects and the country can unite on building a stronger, better Britain. Politicians should now be talking about their work for a better post Brexit Britain. If they aren’t they should step aside or be voted out. Brexiteers need to work together in elections, rallying round single pro Brexit politicians. Encouragingly Anne Marie Waters of the ‘For Britain’ party has taken the lead on this, and it will be interesting to see if others put the country ahead of ego and self-interest. The country is crying out for leadership and Theresa May is paralysed with inertia. She has abdicated any decision making and is desperate for Parliament to give her anything to deliver. Her legacy is at stake – she can be the leader who started the path to a great British sovereign nation again, but instead she risks being the dithering leader who destroyed democracy. Chinas is building skyscrapers in 30 days and yet Britain has such little self belief amongst the political class that many believe their own country to be incapable of grabbing and delivering a global opportunity. What a sad state of affairs for a historically great nation. The stakes are high. A soft Brexit that keeps the UK anchored to the EU will see years of punishment and a reduced say in any decision making. Nobody should want that. The minority of “Remainers” obsessed by thwarting Brexit even to the detriment of the UK must be ignored (up to 20% polled say they’d like to see Britain suffer if Brexit happened). If the democratic process and the vote is rendered meaningless by Parliament, then there is only going to be years of trouble ahead in the UK. Britain watches as the fate of democracy is decided over coming days. Apart from most of the signatures are invalid and signed by bots and non-uk people. If you open the raw data there are many many signatures from all over the world.